do you want to see something aureate?! willst du etwas magisches sehen?! Dieser Eintrag wurde veröffentlicht in Uncategorized von sirpamononen. Permanentlink. I can imagine that, really! Ich warte auf die Dunkelheit und staune. Voin vain kuvitella miten vaikuttavaa revontulien näkeminen on. En ole itse vielä päässyt näkemään vaikka niitä täällä Etelä-Suomessakin kuulemma joskus näkyy. it’s a language, that’s very rich on vowels, but that mutated „ü“ we don’t have at all. gosh, how i love my mother tongue! yes it is – marvelous. did you look at the second video, the longer one? i find it so lovely, full full of lapland atmosphere (it was filmed just a stone’s throw away from my cottage). i speak through your mouth, too. how would i love to be there, now. Is there a special time these days to watch northern lights way up there around your cottage? under good circumstances, around 23.30 (magnetic midnight) is the best time. by the way there is a northern lights-alarm-app in googlestore (i don’t have it). and really, YOUR cottage is there close by??? Oh, I’d like to see this, too! That’s a fantastic phenomenon!!! Have you taken this spectacular photo? The vids are stunning, too! oh no, i didn’t even try! viewing these awe inspiring lights is paralysing me and i just stand there eyes wide open. the name foxfire is of karelian folktradition origin. 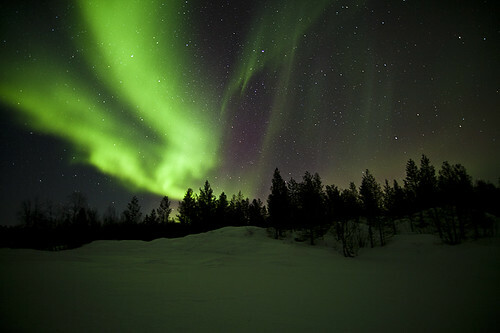 thousands of years one couldn’t find an explanation to this phenomenon in the northern sky. ancient people were wondering, imagining…till starting to tell stories of the precious firefoxes, with silvery or sparkling black fur. whilst running close to each another, touching drawfbirches around the snow-covered arctic hills, luminous sparks were flying… therefore these magnificent lights. Amazing film! You are lucky to have a cottage up there. Mir fallen gar nicht so viele Superlative ein, wie ich hier schreiben möchte…. lovely to see you again! by the way, this beautiful Image is not my win for laurels 😉 it was captured by the same nice fellows, who filmed this enigmatic light show. i’m sure you’d love them and be snap-happy! I’m sure I would !! Wunderschön! Einmal möchte ich das so gerne mit eigenen Augen sehen dürfen.